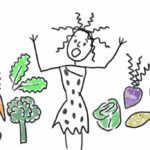 Home » Blog » Celery Juice: Fad or Fabulous? 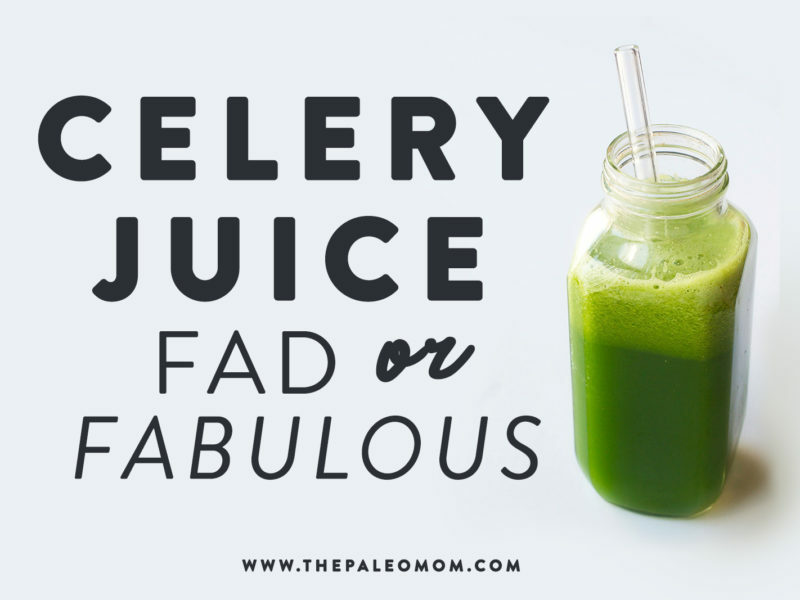 Celery Juice: Fad or Fabulous? Here’s my rule of thumb: If it sounds too good to be true, it probably is. But, like so many health fads, there are scientific studies to support aspects of the hype. 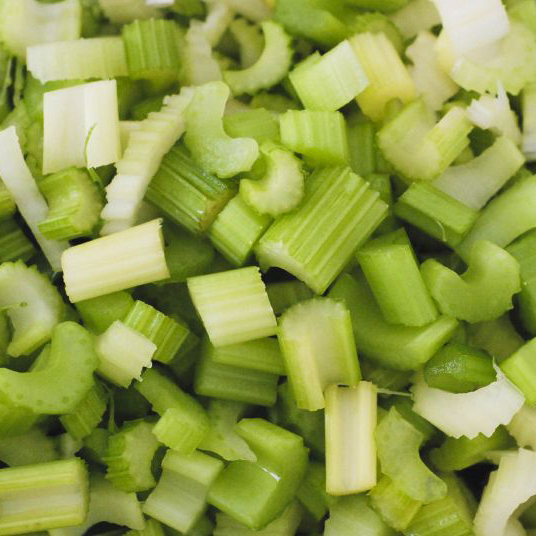 So, let’s separate fact from fiction and dive into the actual health benefits of celery! Celery, whose Latin name is Apium graveolens L, is a plant from the parsley, or Apiaceae, family. 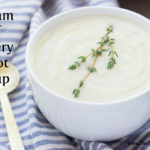 Other members of this botanical family include: carrots, dill, parsley, parsnips, fennel, caraway, anise, cilantro (aka coriander), cumin, and poison hemlock. (I don’t recommend consuming that last one.) Celery grows as either an annual or perennial across the globe, including throughout North America, Europe and the tropical and subtropical regions of African and Asia. You’re almost certainly familiar with celery stalks, but we also eat the leaves, root (also called celeriac) and seeds of the celery plant. 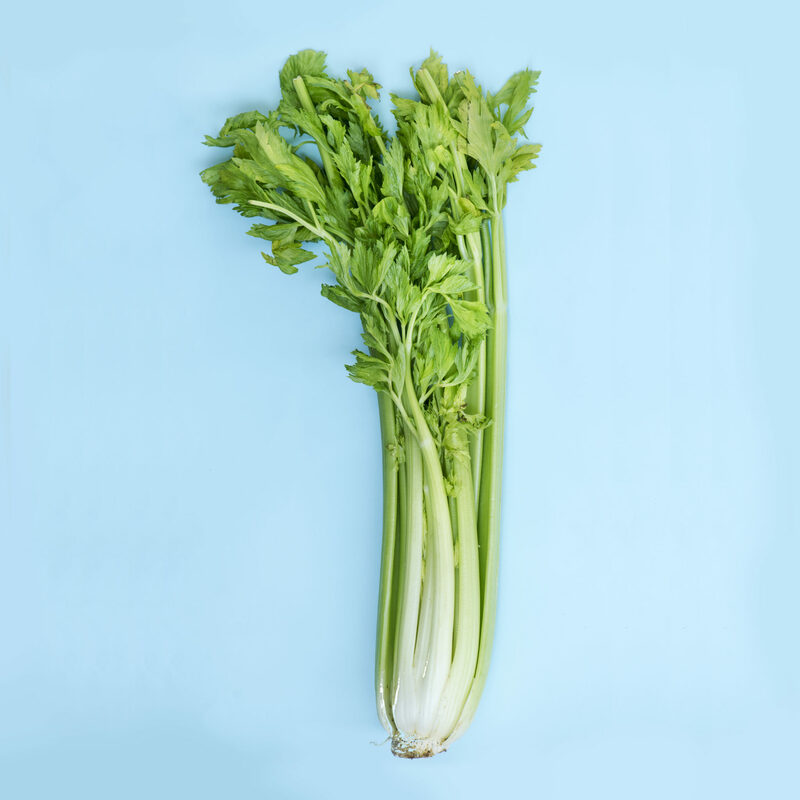 A 100-gram serving of celery stalks (about 1 cup chopped) boasts some impressive nutrition, including: a whopping 1.6 grams of fiber; 37% of the RDA of vitamin K; 5 to 10% of the RDA of vitamins A, C and B9 (folate), potassium and manganese; and lesser but still significant amounts of vitamins, B1, B2, B3, B5, B6, and E, calcium, copper, iron, magnesium, phosphorous, and zinc. All for only 16 calories. Celery is certainly a nutrient-dense vegetable worthy of including in our diet (see The Importance of Vegetables and The Importance of Nutrient Density). 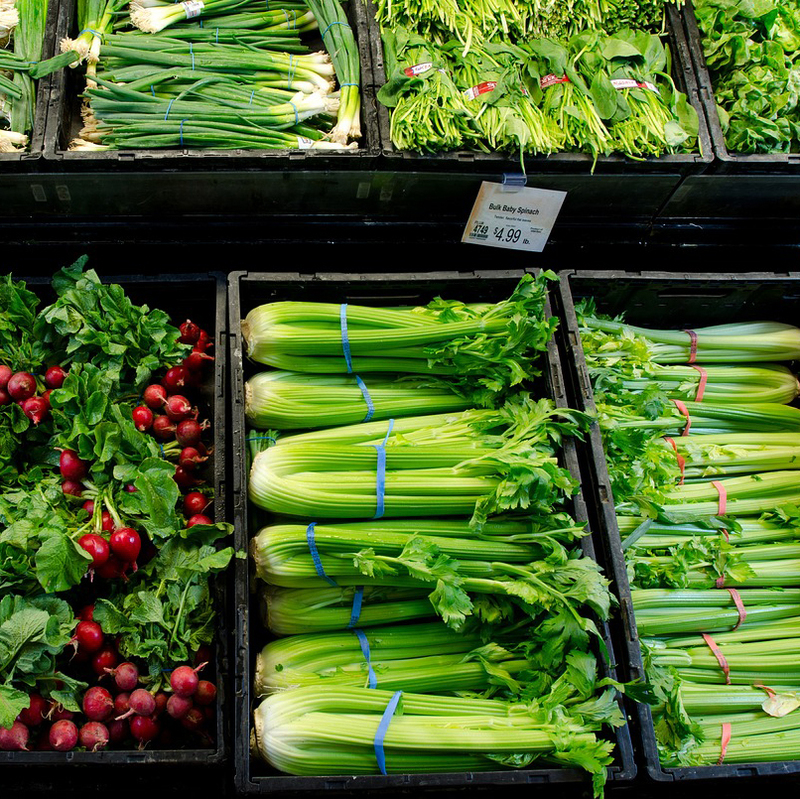 However, even with such impressive fiber, essential vitamin and mineral content, the more important nutritional value of celery is its phytochemical content (see The Amazing World of Plant Phytochemicals: Why a diet rich in veggies is so important!). Phytochemicals are biologically-active compounds in plants (derived from the Greek phyton meaning “plant”), where they serve a variety of functions, such as supporting plant growth and reproduction, or providing defense against pathogens, predators or competitors. Even though the human body can not synthesize phytochemicals, they are not classified as essential nutrients, a fact that reflects more closely our limited knowledge of exactly how these 10,000-plus compounds benefit human health rather than their nutritional importance. Certain phytochemicals have the ability to slow the growth of cancer cells, help regulate hormones, prevent DNA damage, protect against oxidative stress, reduce inflammation, and induce apoptosis (death) in damaged cells (like a spring cleanup)—just to name a few of their beneficial activities. No wonder studies show that the higher our consumption of these beneficial compounds, the lower our risk of chronic disease. A few classes of phytochemicals are the subject of intense study for their promising roles in supporting human health. These include carotenoids (vitamin A precursor molecules like beta-carotenet), chrolophyll, sterols and stanols, glucosinolates, organosulfur compounds, and polyphenols. Polyphenols, of which over 8000 have been identified, exert their most potent effects by acting as antioxidants—preventing cellular damage by neutralizing hazardous oxygen radicals and improving cellular health as a result (which, in turn, benefits virtually every system in the body). As a result of their antioxidant properties, polyphenols also boost the immune system and protect against both chronic and acute diseases. In addition, polyphenols can help regulate enzyme function, stimulate cell receptors, modulate the functions of inflammatory cells (including T and B lymphocytes, macrophages, platelets, and natural killer cells), alter adhesion molecule expression, affect nerve cells and cardiac muscle cells, and exert antiviral effects. See also Polyphenols: Magic Bullet or Health Hype?. apigenin. Studies suggest apigenin can reduce inflammation, prevent cancer, prevent diabetes, improve brain health, reduce pain, and may have a calming effect both via the GABA neurotransmitter system and the HPA (fight-or-flight) axis. caffeic acid. Studies suggest caffeic acid can reduce inflammation, prevent cancer, prevent toxicity associated with chemotherapy and radiation, prevent diabetes, prevent premature aging, prevent neurodegenerative diseases (like Parkinson’s disease), and reduce exercise-related fatigue. chlorogenic acid. Studies suggest chlorogenic acid can reduce blood sugar, prevent diabetes, aid in weight loss, reduce blood pressure, aid in homocysteine detoxification, and enhance mood. chrysoeriol. Studies suggest chrysoeriol can reduce inflammation, regulate the immune system, prevent cancer, and prevent diabetes. p-coumaric acid. Studies suggest p-coumaric acid can reduce inflammation, reduce intestinal inflammation, regulate the immune system, improve bone density, act as an antidepressant, prevent cancer, protect against kidney damage, and protect against tissue damage caused by drugs and alcohol. coumaroylquinic acid. Studies suggest coumaroylquinic acid can increase activity of superoxide dismutase, one of the body’s most important endogenous antioxidant enzymes. ferulic acid. 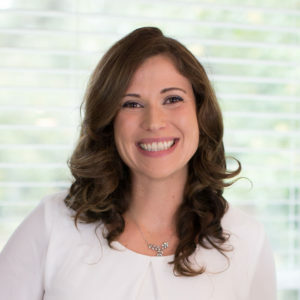 Studies suggest ferulic acid is a particularly potent antioxidant that can reduce inflammation, prevent cancer, prevent toxicity associated with chemotherapy and radiation, prevent diabetes, prevent premature aging, protects the liver and lungs, prevent neurodegenerative diseases (like Alzheimer’s disease), and lowers cardiovascular disease risk factors. kaempferol. Studies suggest kaempferol can reduce inflammation, regulate the immune system, prevent cancer, act as an antimicrobial, prevent diabetes, reduce cardiovascular disease risk factors, prevent neurodegenerative diseases (like Alzheimer’s disease), improve bone health, and aid weight loss. luteolin. 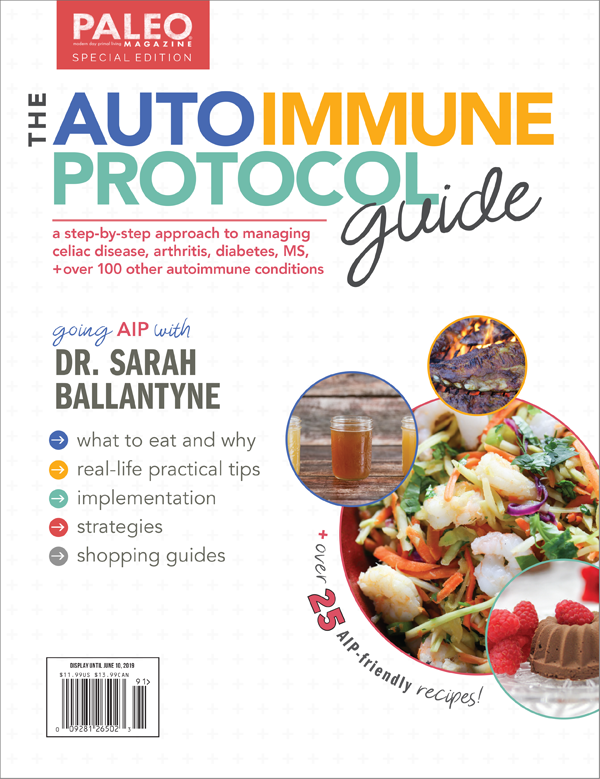 Studies suggest luteolin can reduce inflammation, reduce vascular inflammation, regulate the immune system, reduce allergic responses, protect the brain, prevent cancer, prevent toxicity associated with chemotherapy and radiation, prevent neurodegenerative diseases (like Alzheimer’s disease), reduce pain, and may have a calming effect via the GABA neurotransmitter system. tannin. Studies suggest tannins can reduce inflammation, regulate the immune system, prevent cancer, are antimicrobial, improve blood clotting, reduce cardiovascular disease risk factors, produce liver necrosis, and prevent cavities. While none of these polyphenols are unique to celery, it’s pretty cool that celery contains a good amount of all of them. Research is just starting to identify the ways in which these phytochemicals can benefit us beyond their established very high antioxidant activity. For example, a few of the newly identified phytochemicals in celery have strong anti-inflammatory and immune regulating effects. A few others slow the growth of cancer cells. Celery also has antifungal properties, is a strong anti-inflammatory, improves cognitive function and neuronal density, and has antidepressant activities. It also boosts our endogenous antioxidant enzyme activity, and celery juice has been shown in animal models to be of tremendous benefit during chemotherapy. When you juice a vegetable, you discard the valuable fiber and nutrients that are bound up with the cellular matrix, including some of the essential vitamins, minerals and antioxidant phytochemicals. One study actually measured how many of celery’s flavones (most of celery’s polyphenols are members of the flavone subclass of polyphenols) were extracted into the juice. The researchers used a high-end juicer (the Omega 8006 masticating juicer, if you’re curious) to juice celery stalks and leaves. Celery yielded 79% juice (meaning the other 21% of the liquid content was discarded with the pomace, that fibrous mass leftover when you juice veggies) but only 56% of the flavones were extracted. That means that if you juice your celery and discard to pomace, you’re wasting 44% of the beneficial flavones you could have consumed by simply eating the celery whole. (By the way, these numbers are in the same range as for other vegetables and fruits. There’s more to consider in the juice versus smoothie versus whole food debate (see also Move Over, Smoothies and Juice? The Soup-rising Benefits of Souping!). Some phytochemicals are concentrated in the juice whereas others are more readily left behind in the pomace. Celery juice contains more apigenin, luteolin, and chrysoeriol than its pomace. And, the nutrients in veggie juice do tend to be more readily absorbed, and this is also the case with celery juice. Thanks to enzymatic activity in the celery, when celery is juiced raw, the flavones are predominantly in a chemical form called flavone apiosylglucosides (if the celery is steamed prior to juicing to halt enzymatic activity, more of the flavones are present at malonyl apiosylglucosides, a larger molecule because it has a malonyl moiety [CH2(COOH)2] attached). 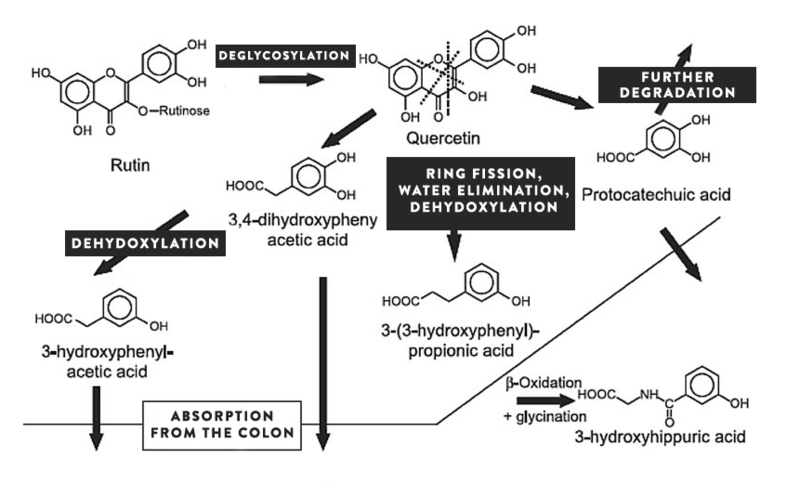 Flavone apiosylglucosides are more readily absorbed in our digestive tracts than malonyl apiosylglucosides because they require relatively simple chemical degradation to be absorbable (hydrolysis). See also Is It Better to Eat Veggies Raw or Cooked? But wait, it’s still more complicated than this! Most of the polyphenols we consume are poorly absorbed in our digestive tracts, even in the smaller molecular form found in vegetable juices. 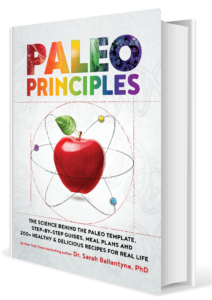 In fact, our ability to benefit from these phytochemicals is nearly completely reliant on their prior metabolism by our gut microbes. In food, most polyphenols are incorporated into larger chemical structures. And while our digestive enzymes can break some of the chemical bonds apart, the majority of the degradation of polyphenols is accomplished by our gut microbes. In addition, after breaking polyphenols apart, our gut microbes further metabolize them to create a wide range of simpler phenolic compounds. For example, the flavonoid rutin is a glycoside abundant in apricots, cherries, grapes, grapefruit, plums, and oranges. Microbial degradation (via deglycosylation) produces the well-known antioxidant quercetin, shown to suppress inflammation in the brain and promote a healthy gut barrier. Quercetin is further metabolized by our gut bacteria, forming a variety of organic acids including: phenylacetic-acetic acid, an organic acid that can be found in tea, peppermint, walnuts, almonds and corn; hydroxyphenyl-acetic acid, an antioxidant abundant in parsley, olives plums, and lemon verbena; and protocatechuic acid, a powerful antioxidant and neuroprotective organic acid found in tea, onions and açaí berry. Thanks to our gut bacteria, a single antioxidant polyphenol can be converted into a whole collection of beneficial polyphenols. What does this mean? We benefit the most from dietary phytochemicals when we have a diverse and healthy gut microbiome to metabolize them for us (see also What Is the Gut Microbiome? And Why Should We Care About It?). And, what do our gut bacteria like? Fiber! 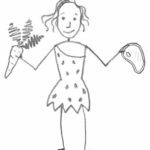 So, why discard celery fiber and 44% of the phytochemicals celery contains when instead we could feed our gut bacteria their favorite food AND benefit from their metabolism of 100% of the phytochemicals in celery! Yes, for my money, I’ll take the more complete benefits of just gnawing on a few stalks of celery. Here’s the million-dollar question. And the answer is….. Nope. I know I’ve shared the very impressive health benefits attributable to the amazing phytochemicals celery has to offer us. 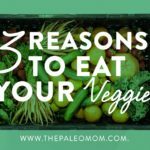 But, the truth is that celery is just one of dozens of vegetables, fruits, herbs and spices that have been extensively studied for their beneficial phytochemicals. There’s nothing about celery that is particularly more magical than kale, broccoli, carrot, beets, blueberries, raspberries, strawberries, currents, grapes, artichoke, cabbage, pomegranate, parsley, tea, cocoa, cinnamon, turmeric, cloves, mint, oregano, rosemary, sage, grapefruit, apple, cherry, garlic, onion, pumpkin, mushrooms, olives, coffee, sea vegetables… need I go on? In fact, the study I mentioned earlier also compared the flavone concentration of celery juice with parsley juice. As I mentioned earlier, celery yielded 79% juice with 56% of the flavones extracted. Parsley on the other hand, yielded 72% juice with 64% of the flavones extracted (more flavones for less juice!). 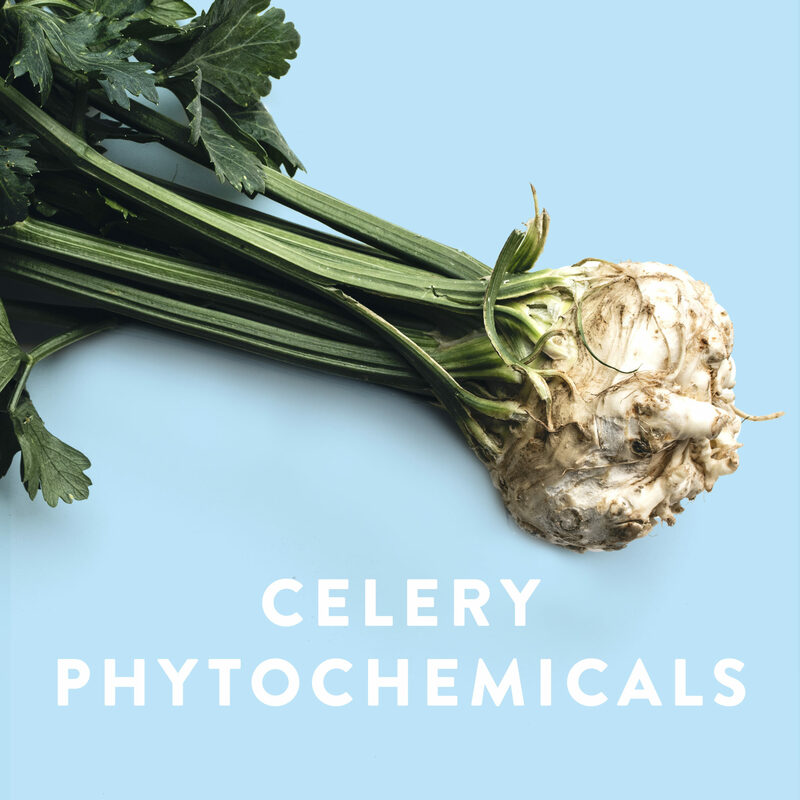 The fresh celery juice contained 28.5 milligrams of flavones per 100 gram whereas the parsley juice was nearly ten times more potent, with 281 milligrams of flavones per 100 grams! These data aren’t making a case for parsley juice every morning instead of celery juice, but rather to illustrate that celery is one of many phytochemical-rich nutrient-dense veggies worth including in our diet. Let’s revisit the list of well-known polyphenols in celery. Apigenin is found in many vegetables and herbs, but the best sources are parsley, celery, lettuce, grapefruit, oranges, onions and tea. Coffee is the best source of caffeic acid in most people’s diets. (If you don’t drink coffee, you can get caffeic acid from wine, turmeric, basil, thyme, oregano, sage, cabbage, apples, strawberries, cauliflower, radishes, mushrooms, kale, pears and olive oil.) Chlorogenic acid is one of the main antioxidants in coffee, but it can also be found in tea, sunflower seeds, blueberries, potatoes, tomatoes, apples, pears and eggplant. Chrysoeriol is very high in alfalfa, rooibos tea, and açaí berries. Besides celery, you can also get p-coumaric acid from tomatoes, carrots, basil, garlic, potatoes, apples, pears, grapes, and oranges. Coumaroylquinic acid can be found in notable amounts in apples, tea, quince and apple cider vinegar. You can get ferulic acid from artichoke, bamboo, nuts, pineapples, coffee, orange, grapefruit, cabbage, spinach, eggplant and beets. Kaempferol can be obtained from apples, grapes, tomatoes, green tea, potatoes, onions, broccoli, Brussels sprouts, squash, cucumbers, lettuce, green beans, peaches, blackberries, raspberries, and spinach. Besides celery, luteolin is particularly high in green peppers, chamomile tea, oregano, peppermint, sage, thyme, carrots, artichoke, olives and radicchio. And finally, we can get tannins from tea, red wine, grapes, grapefruit, berries, apples, nuts, chocolate, rhubarb, and squash. Yes, celery is fabulous, but the purported cure-all benefits of a daily dose of celery juice is a fad. And, instead of hopping on that unsubstantiated bandwagon, I recommend overall consuming a wide variety of vegetables and fruits and aiming for 8 servings per day as a minimum. Al-Howiriny T, Alsheikh A, Alqasoumi S, Al-Yahya M, ElTahir K, Rafatullah S. Gastric antiulcer, antisecretory and cytoprotective properties of celery (Apium graveolens) in rats. Pharm Biol. 2010 Jul;48(7):786-93. doi: 10.3109/13880200903280026. Boonruamkaew P, Sukketsiri W, Panichayupakaranant P, Kaewnam W, Tanasawet S, Tipmanee V, Hutamekalin P, Chonpathompikunlert P. Apium graveolens extract influences mood and cognition in healthy mice. J Nat Med. 2017 Jul;71(3):492-505. doi: 10.1007/s11418-017-1077-6. Chonpathompikunlert P, Boonruamkaew P, Sukketsiri W, Hutamekalin P, Sroyraya M. The antioxidant and neurochemical activity of Apium graveolens L. and its ameliorative effect on MPTP-induced Parkinson-like symptoms in mice. BMC Complement Altern Med. 2018 Mar 20;18(1):103. doi: 10.1186/s12906-018-2166-0. Danciu C, Zupko I, Bor A, Schwiebs A, Radeke H, Hancianu M, Cioanca O, Alexa E, Oprean C, Bojin F, Soica C, Paunescu V, Dehelean CA. Botanical Therapeutics: Phytochemical Screening and Biological Assessment of Chamomile, Parsley and Celery Extracts against A375 Human Melanoma and Dendritic Cells. Int J Mol Sci. 2018 Nov 16;19(11). pii: E3624. doi: 10.3390/ijms19113624. Golden MC, Wanless BJ, David JRD, Kottapalli B, Lineback DS, Talley RJ, Glass KA. Effect of Cultured Celery Juice, Temperature, and Product Composition on the Inhibition of Proteolytic Clostridium botulinum Toxin Production. J Food Prot. 2017 Aug;80(8):1259-1265. doi: 10.4315/0362-028X.JFP-17-011. Hostetler GL, Ralston RA, Schwartz SJ. Flavones: Food Sources, Bioavailability, Metabolism, and Bioactivity. Adv Nutr. 2017 May 15;8(3):423-435. doi: 10.3945/an.116.012948. Hostetler GL, Riedl KM, Schwartz SJ. Endogenous enzymes, heat, and pH affect flavone profiles in parsley (Petroselinum crispum var. neapolitanum) and celery (Apium graveolens) during juice processing. J Agric Food Chem. 2012 Jan 11;60(1):202-8. doi: 10.1021/jf2033736. Epub 2011 Dec 30. Köken T, Koca B, Özkurt M, Erkasap N, Kuş G, Karalar M. Apium graveolens Extract Inhibits Cell Proliferation and Expression of Vascular Endothelial Growth Factor and Induces Apoptosis in the Human Prostatic Carcinoma Cell Line LNCaP. J Med Food. 2016 Dec;19(12):1166-1171. Kolarovic J, Popovic M, Mikov M, Mitic R, Gvozdenovic L. Protective effects of celery juice in treatments with Doxorubicin. Molecules. 2009 Apr 24;14(4):1627-38. doi: 10.3390/molecules14041627. Kolarovic J, Popovic M, Zlinská J, Trivic S, Vojnovic M. Antioxidant activities of celery and parsley juices in rats treated with doxorubicin. Molecules. 2010 Sep 3;15(9):6193-204. doi: 10.3390/molecules15096193. Kooti W, Daraei N. A Review of the Antioxidant Activity of Celery ( Apium graveolens L). J Evid Based Complementary Altern Med. 2017 Oct;22(4):1029-1034. doi: 10.1177/2156587217717415. Li MY, Hou XL, Wang F, Tan GF, Xu ZS, Xiong AS. Advances in the research of celery, an important Apiaceae vegetable crop. Crit Rev Biotechnol. 2018 Mar;38(2):172-183. doi: 10.1080/07388551.2017.1312275. Lin LZ, Lu S, Harnly JM. Detection and quantification of glycosylated flavonoid malonates in celery, Chinese celery, and celery seed by LC-DAD-ESI/MS. J Agric Food Chem. 2007 Feb 21;55(4):1321-6. Popović M1, Kaurinović B, Trivić S, Mimica-Dukić N, Bursać M. Effect of celery (Apium graveolens) extracts on some biochemical parameters of oxidative stress in mice treated with carbon tetrachloride. Phytother Res. 2006 Jul;20(7):531-7. Sowbhagya HB. 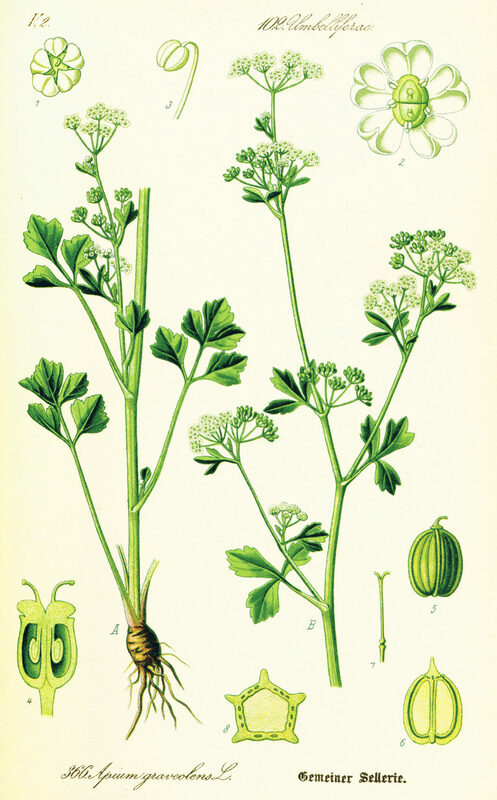 Chemistry, technology, and nutraceutical functions of celery (Apium graveolens L.): an overview. Crit Rev Food Sci Nutr. 2014;54(3):389-98. doi: 10.1080/10408398.2011.586740. Review. Crit Rev Food Sci Nutr. 2014;54(3):389-98. doi: 10.1080/10408398.2011.586740. Sukketsiri W, Chonpathompikunlert P, Tanasawet S, Choosri N, Wongtawatchai T. Effects of Apium graveolens Extract on the Oxidative Stress in the Liver of Adjuvant-Induced Arthritic Rats. Prev Nutr Food Sci. 2016 Jun;21(2):79-84. doi: 10.3746/pnf.2016.21.2.79. Uddin Z, Shad AA, Bakht J, Ullah I, Jan S. In vitro antimicrobial, antioxidant activity and phytochemical screening of Apium graveolens. Pak J Pharm Sci. 2015 Sep;28(5):1699-704. Zhu LH, Bao TH, Deng Y, Li H, Chen LX. Constituents from Apium graveolens and their anti-inflammatory effects. J Asian Nat Prod Res. 2017 Nov;19(11):1079-1086. doi: 10.1080/10286020.2017.1381687. Epub 2017 Oct 3. 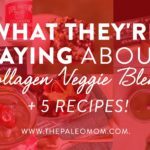 What They're Saying About Collagen Veggie Blend Plus 5 Recipes! 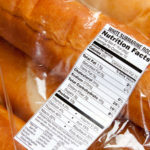 Why Aren’t Humans Adapted to Grains? Our functional medicine doctor is also certified in TCM. He is having my husband juice specifically celery, cucumber, cilantro, ginger, rosemary, and turmeric as part of his daily regimen for leukemia treatment. When I asked him why not carrots or beets or kale or any other vegetable, herb or fruit he stated the TCM principles of damp or heat, etc associated with various foods. So there must be something else as yet unstudied in western medicine or possibly not as quantifiable that makes celery and these others we are using more appropriate for certain conditions than others. Thank you for this article on celery juice. I have read Medical Medium books, yours and many others. I have Sjogrens Syndrome and RA, diagnosed 2 years ago. I seem to be searching for a “cure me now” fix to feel better. I have been drinking celery juice for 4 weeks now and AIP for over a year, I have definitely improved but just can not get to my old 100% self. I do thank you for all your knowledge and explanations of food.